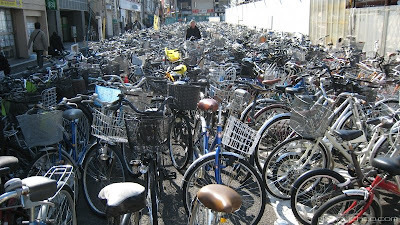 The Problem : Tokyo is an overcrowded city, with 15 million bicycles registered to Tokyo's 30 million residents. Land is expensive. Bicycles here are only the first link in the long commuting chain from home to work by rail. Bicycles also tend to be parked illegally because there is almost no railway owned bicycle parking. These bicycles are then raided and confiscated by officers, and a fine of almost 20 dollars or more is incurred to get it back. The density of bicycles parked on sidewalks or roadsides severely hinder road traffic and pedestrians. An Engineering Solution : The railways and subways realized they have a duty to provide parking for their customers using the bicycle as the first mode of access. Nishi-Kasai Station in Edogawa now boasts something thats easily the first of its kind - a huge multi-level bicycle parking tower that is fully automated. The system can store upto 9,400 bikes. There are similar facilities for cars and can be found in many places in Japan. It works almost like a jukebox. A customer places their bike on a small platform and presses a green button on the computer interface in front of him. An elevator door opens, a robotic gripper holds the bike and transports it vertically down to an underground parking garage for storage. For retrieval, a card is swiped against the terminal's reader and the system fetches the bicycle in about 22 seconds. A single use costs 100 yen (97 cents) or you can fill your card with a month's pass for 1800 Yen (17 dollars). [Japan Probe] I'm guessing the retrieval system might be bar code/RFID based system but anyone who knows the intricacies of operation can post a comment here based on his/her knowledge. This should help get rid of the bicycle clutter in the city. But the question now is will middle and low income families be ready to accept the additional costs per month and year just to go out and buy groceries or pick kids up from school? Surely its a more cheaper and society friendly option than having to get back confiscated bikes, or having a generally messy looking city. Technological questions in my mind are : Does the system recognize a bicycle when the elevator doors open? What if a human or another object accidentally slides in? Is the facility shut down in times of maintenance and what happens if you happen to have a bike stored inside at that time? Could it be possible to retrieve a bicycle from any of the multiple computer terminals? Is damage insured? Etc...etc. If you can think of any, throw them out here in the comments.